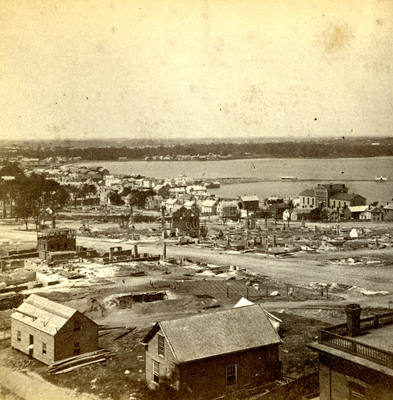 "Panoramic View from Portland Observatory, looking toward Back Cove." Panoramic View from Portland Observatory, looking toward Back Cove. Panoramic view from Portland Observatory, looking southwest, showing burnt district of Munjoy Hill. Cumberland Avenue at center. Back Cove in background, with Gould's Wharf in background right. County Jail, on Monroe Street at right edge. "Panoramic View from Portland Observatory, looking toward Back Cove." (1866). The Great Fire : 1866 - Stereoscopic views. 25. Portland, Me., Great Fire, Portland, Me., 1866, East End, Munjoy Hill. Back Cove.